Thursday was getaway day and the Reds had scheduled a 12:35 finale. It reduces the time between games but it also gives me a 30 minute head start back to Wisconsin. I left Mary Kate’s apartment at 11:30 and was parked in one of the $10 lots 15 minutes later. 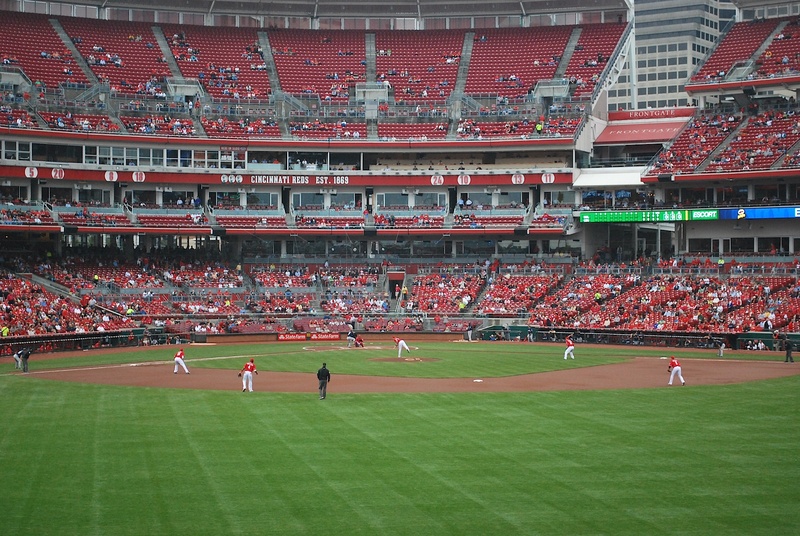 I picked up my ticket from will call and was inside Great American Ballpark by noon. I had already taken 8 game number pictures from inside and outside of the park so I had some trouble deciding where I wanted it taken. I ended up going to the top row of seats beyond the right field wall. There was no one within 15 rows of me and I tried propping my camera up like I had in Pittsburgh but it didn’t work too well. Shortly before the national anthem I gave up, walked down the steps to the nearest fan (Mike), and asked him politely if he could help me out. He’s a season seat holder and was very interested in my mission and was nice as could be. Thanks Mike! 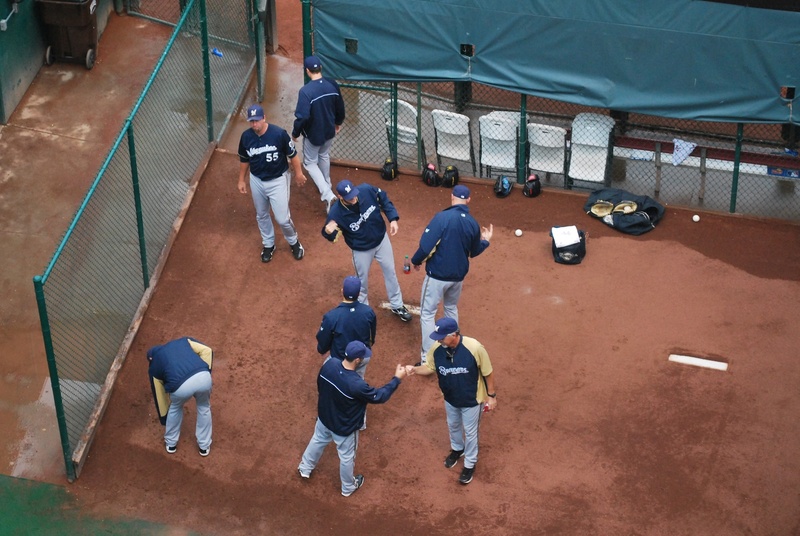 The Brewers relievers had just made their way out to the bullpen so I went over to the edge of the stands to get a few pictures of their handshakes. Most of them have specific handshakes with each other, and it’s fun to watch. I remember seeing them do a handshake routine with some Miller Park staffers last season. It involved a handshake and then a sweeping [the floor] gesture while whistling. Oh the bullpen. My seat was in section 112 but after seeing how empty the left field seats were I decided to sit there for a while. I couldn’t get there in time for the first pitch and stopped just to the left of the batter’s eye. Mat Latos delivered a called strike to Norichika Aoki to get things started. 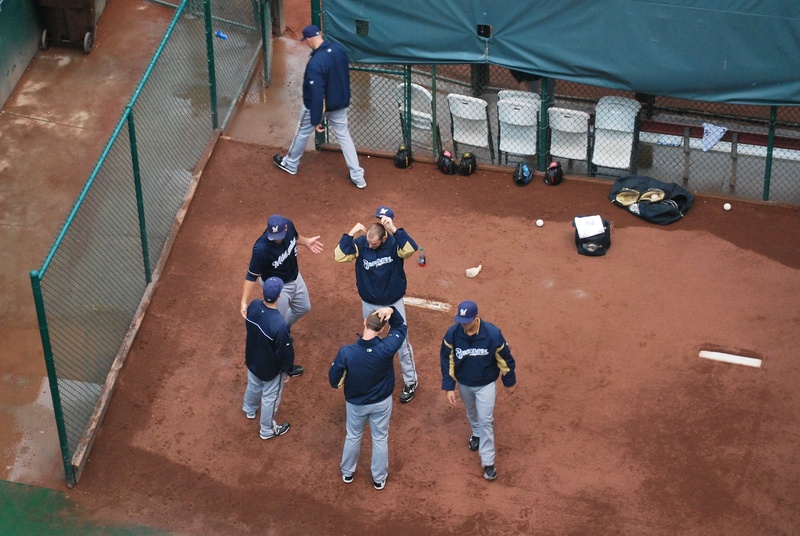 I made my way over to the left field seats by the time the Brewers took the field for the bottom of the 1st. 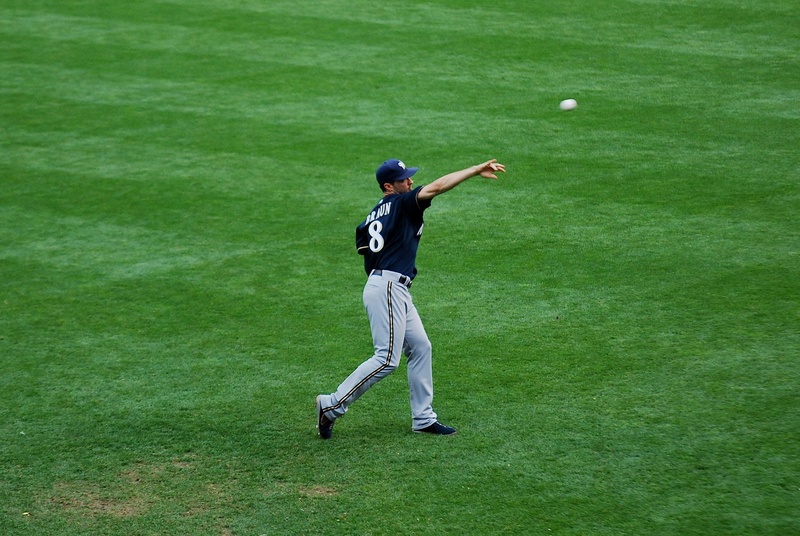 Ryan Braun warmed up with the ball boy that sits along the left field line to scoop up foul balls. Wily Peralta started for the Crew and he bounced back nicely from his previous start. Here he is about to unleash a pitch in the 1st inning. In the bottom of the 2nd Carlos Gomez made a great catch on a Jay Bruce fly ball to deep centerfield. It wouldn’t have been a home run but it was mighty close. Go-Go led off the top of the 3rd and I was thinking to myself that it would be cool if he hit a home run immediately after taking an extra base hit away in the previous half inning. Bang! Wish granted. Gomez sent the 1-1 pitch over the wall in right field to give the Brewers a 1-0 lead. 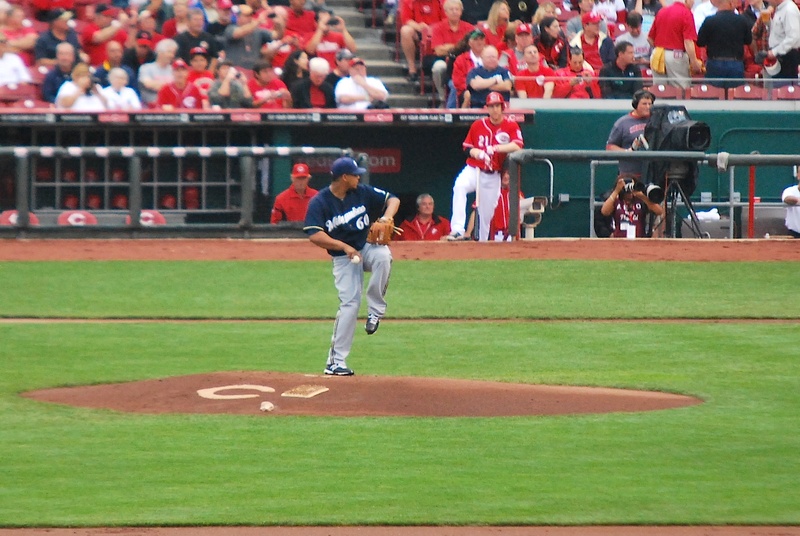 In the bottom of the 6th Wily Peralta struck out Reds starter Mat Latos. When the Brewers threw the ball around the horn after the strikeout Aramis Ramirez hung onto the ball and called out the trainer. Apparently Ramirez had pointed something out to Roenicke earlier in the game about Peralta and they had kept an eye on him. 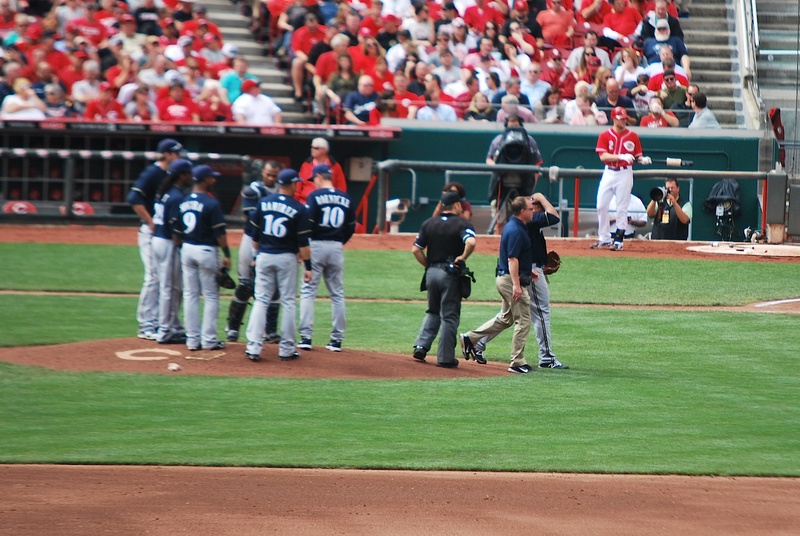 Roenicke and the trainer came out of the dugout in the 6th and Peralta was pulled from the game. It’s said to be a biceps issue but it doesn’t appear to be too serious. 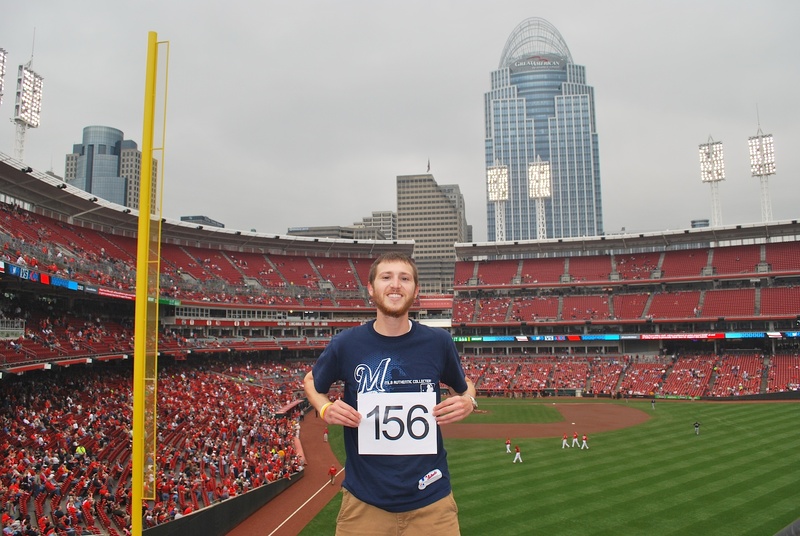 The Brewers held the 1-0 lead and I slowly made my way around the concourse towards the right field corner. I had a hot dog along the way and the concession stand worker took my money with her gloves on. She then proceeded to pick up the bun and serve me the hot dog. Interesting… I considered saying something to her but I didn’t. I did stop by guest relations to let them know about the infraction. The lady at guest relations said that I should’ve said something. So I’m supposed to be a fan at the game and serve as the disciplinarian for the concession workers. Right……..
Axford came on and struck out the first two batters he faced. One more out and the Brewers had the series. Ax started Todd Frazier off with a fastball that caught a lot of the plate and Frazier didn’t miss, sending one over the centerfield fence for a game-tying home run. 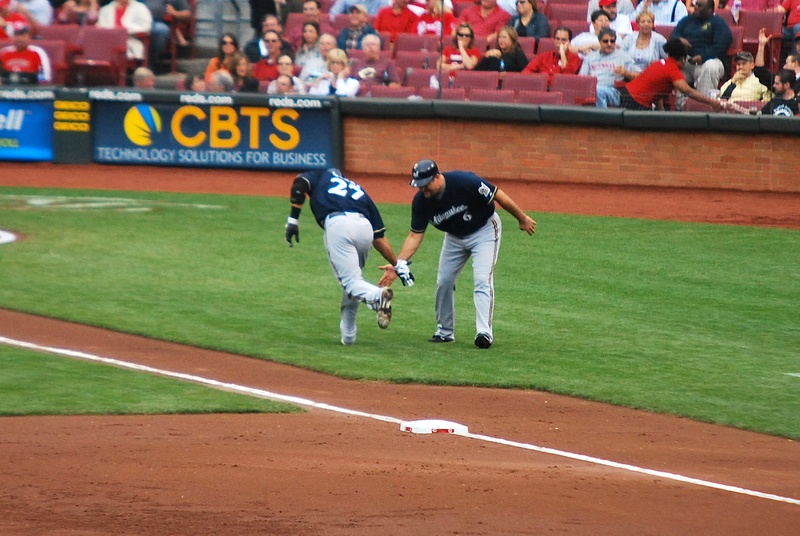 The next pitch was singled to left and the Reds now had the winning run at first base. A nine pitch battle between Axford and Dioner Navarro followed. Two of the pitches were hit foul down the right field line that would have been home runs had they been 20-30 feet to the left. The 9th pitch of the at bat was hit to right center and deep. 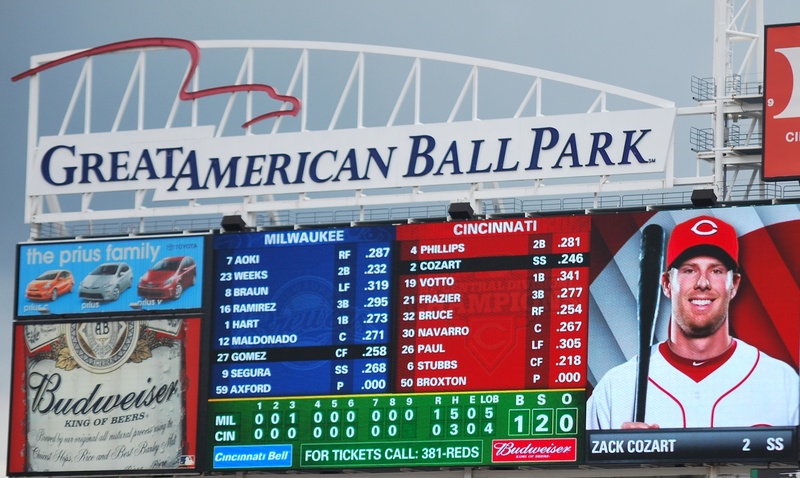 I thought Aoki could’ve had it but he played it on a bounce and the Reds were walk-off winners. It was a heartbreaking loss that sums up the season; so close yet so far. Final score: Reds 2 – Brewers 1. If the Brewers would’ve held on for the 1-0 win it would’ve been their second 1-0 win of the season, the other coming on June 22nd vs. the White Sox at U.S. Cellular Field (I was at that game too!!!). I got back to my car and was on the road at 3:33 eastern time. 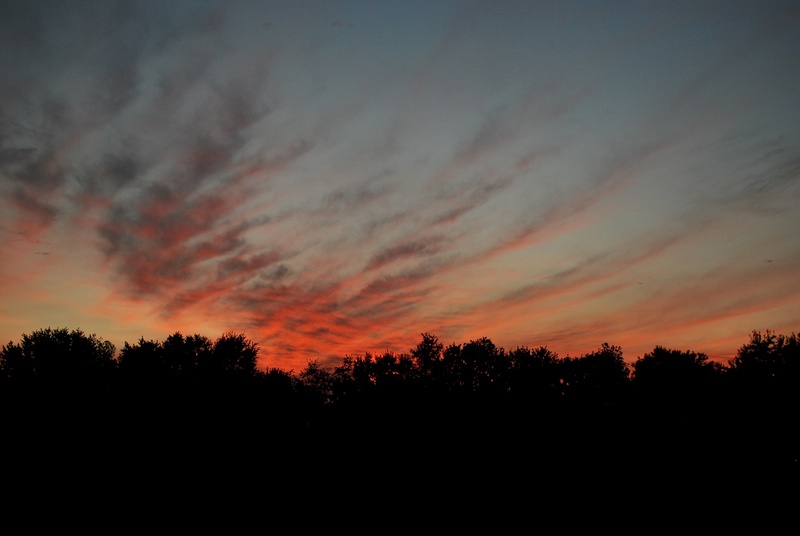 I stopped for gas at 7:30 and took a picture of the sunset. It took me 7 hours and 15 minutes to traverse the 468 miles (which includes my 25 minute stop for gas and dinner). Not bad at all. It’s noon on Friday and I’ll be leaving in a few hours for the first game of the 6-game home stand. I’m going to try and walk the parking lots to hand out cards and “informationalize” people about Be The Match. Knee pain be damned! Let’s get it!